Nutrients in the San Francisco Bay are a major issue for the Bay Area water quality community. Historically, the San Francisco Bay has not been adversely impacted by nutrient loading even though it is nutrient-enriched compared to other estuaries around the country. Stakeholders in the Region wish to better understand this resiliency, and whether it may be threatened in the future. Numerous scientific studies are being conducted by several entities, including the Regional Monitoring Program, to understand the impact of nutrients on the San Francisco Bay. BACWA members are major contributors to help fund the studies. While these studies are ongoing, BACWA leadership is working with regulators to ensure that any future nutrient effluent limits are based on sound science. 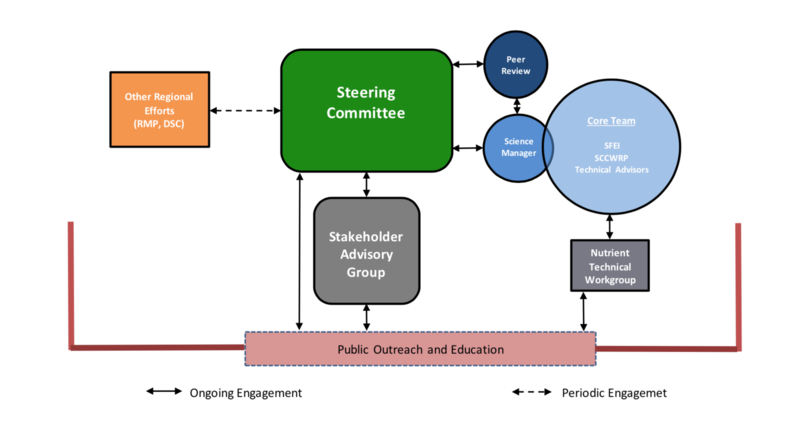 This page provides a central location to access BACWA’s library of documents related to nutrients, links to nutrient efforts around the Bay Area, as well as nutrient-related presentations from previous meetings. It will be updated frequently to alert BACWA members to upcoming nutrient-related meetings as well as other developments. 1. Nutrient Monitoring- Each agency is responsible for its own effluent monitoring, as required by the Permit. 2. Reporting – BACWA will provide the group annual report, due each year on October 1. Starting with the 2016 Annual Report, Agencies will input their data into the Group Annual Report Data Input Workbook. Other ongoing Regional Scientific Efforts that are included in the orange box include the Regional Monitoring Program (RMP) Nutrient Strategy, Surface Water Ambient Monitoring Program (SWAMP) Suisun Bay Workplan, and the San Francisco Bay Nutrient Numeric Endpoints (NNE) Development which is part of the Statewide initiative to address nutrients. 4. Identification of treatment optimization and upgrade oportunities for all major dischargers – BACWA worked with a consultant team led by HDR to perform the Regional Optimization and Upgrade Studies that were required by the watershed permit. The consultant team conducted site visits throughout Spring and Summer of 2015 to identify optimization, upgrade and sidestream treatment alternatives for all the facilities that were required to participated in the Studies. Individual Facility Reports were included in the final Optimization/Upgrade Report as appendices, and were summarized in the main body of the Report. The Final Nutrient Treatment by Optimization and Upgrade Study report was submitted to the Regional Water Board on June 26 ,2018.